The engraved Circlet Optical Crystal Award is 15cm high and it is hand crafted from optical crystal and has a silver plated star bonded to the front. It is supplied in a presentation box, and the price includes up to 50 characters engraved for free. Any additional characters to personalise the award are then charged at 25p each, and there is also an additional cost for a logo. 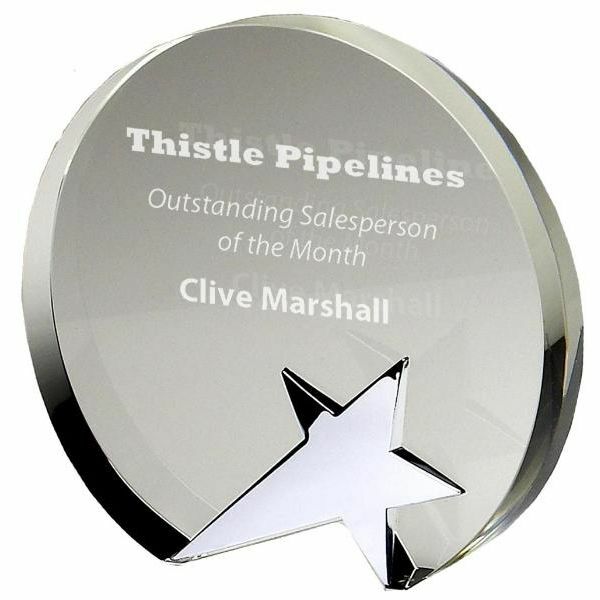 The award is also available in a larger size which is 18cm high. The engraving area of the 15cm Circlet Optical Crystal Award with Silver Star is 9cm wide by 5.5cm high. The engraved Circlet Optical Crystal Award is postage band B.